The element aichill also occurs in Glenelly, at the head which Carnanelly stands. 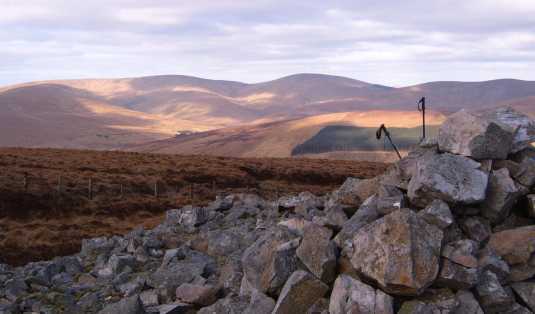 Patrick McKay suggests that the look-out point in both names may be the mountain of Carnanelly itself (DUPN). Carnanelly is the 386th highest place in Ireland. Started this walk from the beginings of Glenlark forest, reached by a high and lonely road from the hamlet of Sperrin - there is room for several cars to park at a cattle grid at 646927 A. Walk back along the road out of the forest and follow the open hill along the forest edge, would not be a pretty picture in wet weather. Already at a height of over 1000 ft, with Sawel and Dart beautifully framed across the valley. 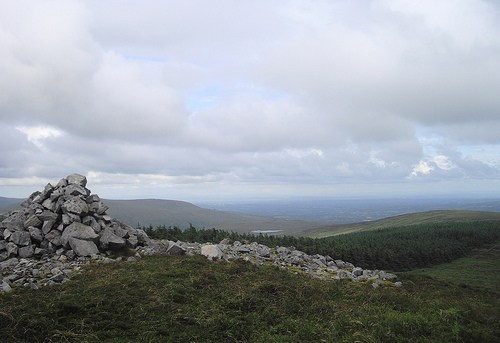 Leave Glenlark forest behind and shortly thereafter pick up and follow the edge of Sawelabeg forest to the top of Mullaghbane (467 m) with views SW to Mullaghcarn and the Bluestacks. 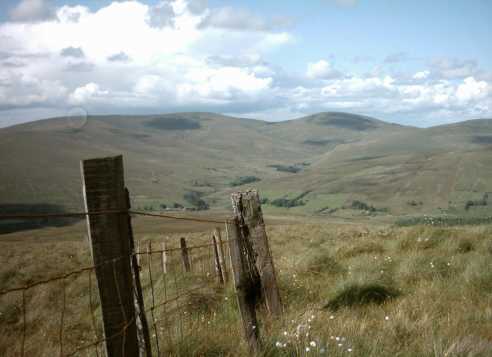 Leave the last few straggling trees behind and follow the fenceline downhill, looking along the heavily forested Glenlark river valley (climbing this side of the Genelly valley brings home the true extent of forestry operationasin the Sperrins) before climbing to point 505 m (664921 B), after 45 minutes of walking. 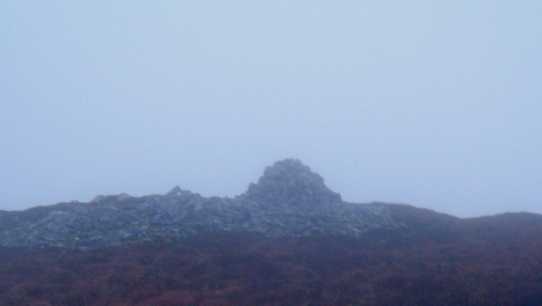 The everchanging views now present Meenard and Mullagheaney as companions as drop and rise to the summit of Carnanelly. Pass rocky outcrops which are the true summit and drop slightly to an area of stones which were obviously a handy spot to build a cairn. Views open out here to the S and E towards Slieve Gallion and Lough Neagh.